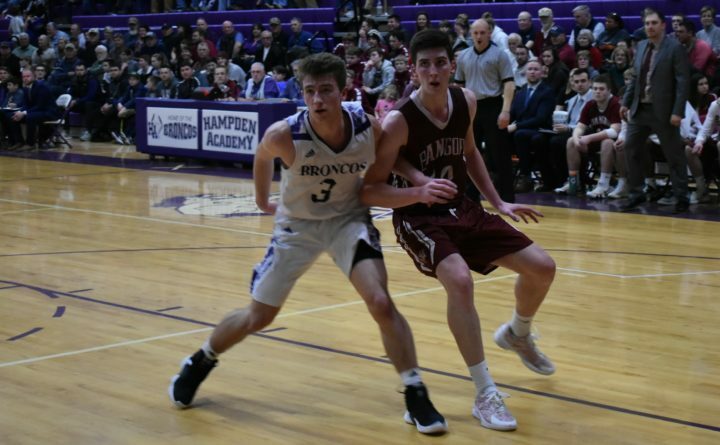 Kory Winch of Hampden Academy (left), pictured battling for position with Bangor's Matt Fleming during a recent game, sparked the Broncos to victory over Brewer on Thursday night. BREWER, Maine — Guards Kory Winch and Bryce Lausier combined for 38 points Thursday night as Hampden Academy defeated Brewer 62-46 in a Class A North boys basketball matchup. Winch, a senior, scored 10 of his game-high 21 points in the first quarter to stake the Broncos (10-2) to an early lead, and he also grabbed 11 rebounds while limiting Brewer senior guard Brandon Glidden to five points. Lausier, a junior guard, added 17 points and seven rebounds for Hampden while junior forward Mikey Raye scored nine points. Senior forward Trevor Pearson and sophomore forward Dylan Huff scored nine points apiece for Brewer (5-7), while freshman guard Aaron Newcomb added seven. Marc Hutchings, the senior center for Hampden who eight days earlier suffered multiple injuries in an early morning pickup truck accident, was released from the hospital Wednesday and surprised many of his teammates by joining them on the Broncos’ bench for the game. This game proved much more competitive than the earlier meeting between the teams this season, a 71-39 Hampden victory on Dec. 21. But the more veteran Broncos simply had more size and experience than the youthful Witches, who had won four of their previous five games. Winch scored 14 points and grabbed eight rebounds during the first half as Hampden gradually moved out to a 34-22 intermission lead. Winch made his first four shots, including two from beyond the 3-point arc, as the Broncos outscored Brewer 9-2 over the final three minutes of the opening quarter to take a 17-11 advantage. Lausier then scored seven of his 10 first-half points during the second quarter, including a 3-pointer to open the period. Brewer used a follow-up basket by freshman guard Colby Smith and a 3-pointer and a drive by Huff to pull within 24-18 midway through the period. Hampden capped off the half with freshman T.J. Henaghen one-timing a lead pass from Winch into the basket from the lane as time expired as Hampden matched its largest lead of the half. Ross Webb opened the second half with a 3-pointer as Hampden’s lead grew to 37-22, and while Brewer did get back within 44-36 on a Newcomb jumper late in the third quarter, a Henaghen layup and a 3-pointer by Lausier gave the Broncos a 49-36 cushion entering the final period.